"Strips of bison flank steak are quickly stir-fried with bell peppers, onion, and jalapeno and served hot on tortillas with salsa, sour cream, and guacamole." If desired, partially freeze bison flank steak for easier slicing (about 30 minutes). Thinly slice across the grain into bite-size strips. 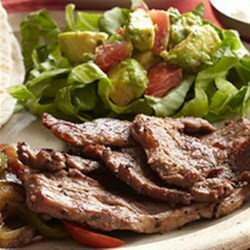 Sprinkle sliced bison flank steak with 1 teaspoon of the fajita seasoning. Cover and chill for 30 minutes. Heat 1 tablespoon of the oil over medium-high heat in a large skillet. Cook garlic and the 1 jalapeno pepper in the hot oil for 2 minutes. Add onion. Cook and stir for 6 to 8 minutes or until onions are tender and begin to caramelize. Remove onion mixture to a medium bowl; cover and keep warm. Add bell peppers and remaining 1/2 teaspoon of fajita seasoning to skillet. Cook and stir for 6 to 8 minutes or until peppers are tender. Add peppers to onion mixture; cover and keep warm. Add the remaining 1 tablespoon oil to the skillet. Add 1/2 of the bison flank steak strips to skillet. Cook and stir for 1 to 2 minutes or until bison flank steak is browned. Remove from skillet and cook remaining bison flank steak. Guacamole Salad: Combine tomatoes, green onions, the 1 jalapeno pepper, the 2 cloves garlic, the salt, and pepper in a medium bowl. Gently stir in avocado. Serve on shredded romaine. Learn how to make a fresh, healthy Thai salad with grilled low-fat bison steak.